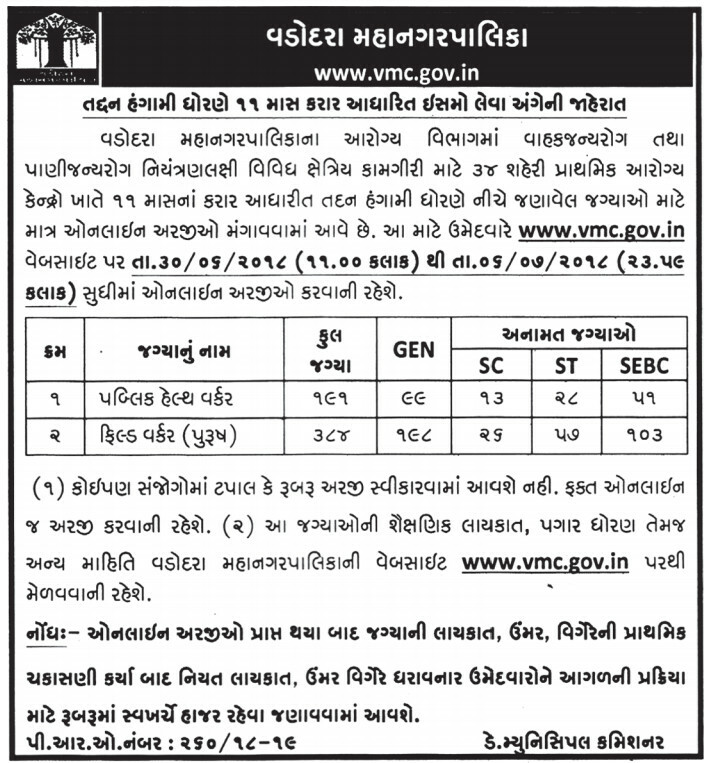 Vadodara Municipal Corporation published recruitment advertisement for various post. Corporation invite young and aspirant candidate, to fill various post mentioned advertisement. VMC will be invited eligible candidate for various post. Aspirant candidate who are seeking a job in VMC for them good chance to apply. Corporation invited application through online mode. Candidate posses qualification they all are apply for VMC Recruitment. Applicant may apply through online mode application on its official website vmc.gov.in. Candidates are advise read all instruction like education qualification, age limit, important date, pay scale, how to apply, exam pattern, selection process and etc on official website vmc.gov.in. Candidate have to go on official website i.e vmc.gov.in. The Vadodara Municipal Corporation has has released an employment notification inviting for public health worker & field worker recruitment. This is a good chance interested candidate who are seeking job in Vadodara municipal corporation. Eligible and aspirant candidate may apply for mentioned post. Applicant may apply through online mode in www.vmc.gov.in. No other mode of application accepted. Online application start from 22nd March, 2019 to 5th April, 2019 on its official website. 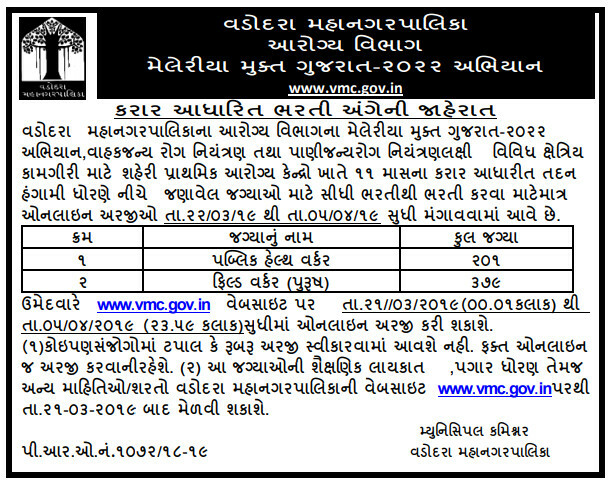 The Vadodara Municipal Corporation released notification for public health worker & field worker recruitment. Eligible and aspirant candidate may apply for mentioned post. This is a good chance interested candidate who are seeking job in vadodara municipal corporation. Applicant may apply through online mode in www.vmc.gov.in. No other mode of application accepted. Online application start from 30th June, 2018 to 6th July, 2018 on its official website. Candidates are advise to bookmarks this page and be regular touch on this page for get more latest updates about vmc.gov.in- VMC Recruitment 2018.